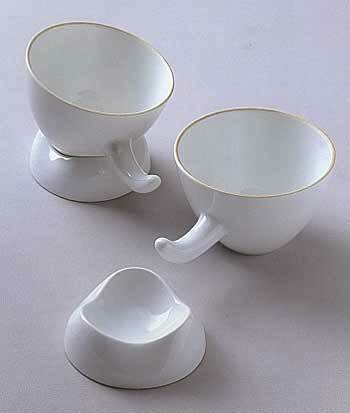 Cups with their few appendages have not been prone to over-elaboration. 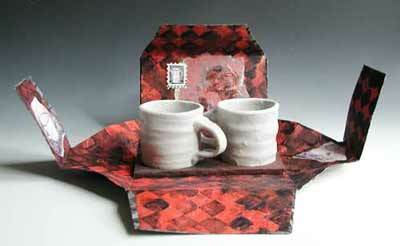 Cups are generally overlooked; less often submitted to juried shows and infrequently chosen with curatorial insight. 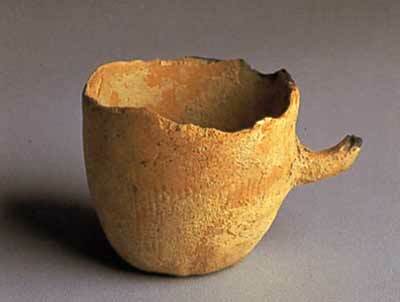 (One exception is Galerie Besson's London exhibit, Millenium Mugs.) Perhaps this is good. 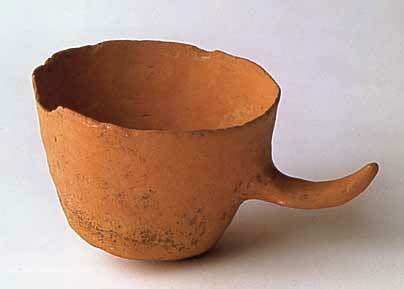 Teapots, for instance have become an artform unto themselves. Spouts and lids are artfully concealed in trompe l'oeil frolics. 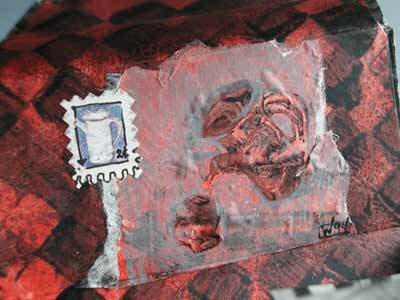 Embellished and enhanced, physical interaction becomes superfluous. But the focus here, as always, is a tensioned coexistence among feeling, form, and interaction. Cups need not be simple. 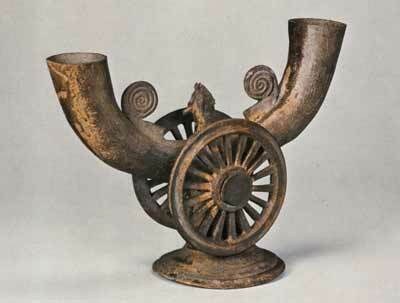 There are historical precedents for some unusual resolutions, such as this Korean horn-shaped cup on a wheeled pedestal (Kaya Kingdom, 5th century AD). 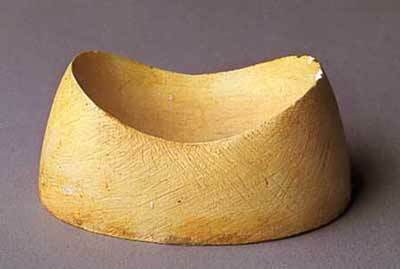 But taken as an intriguing aesthetic quandary--how to dovetail expression and function--forestalls a too lavish base or saucer that dissipates our awareness of the cup itself. 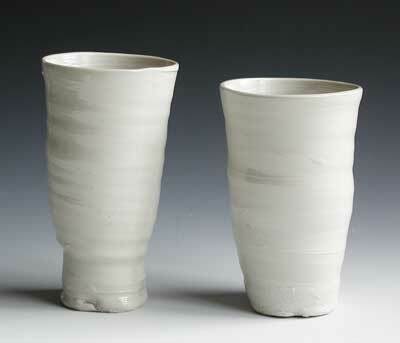 Catherine White's cup boxes are meant to pivot our attention to this overlooked form without festooning the form itself. The unfolding of the box is consummated by drinking. This inherent potential is diminished should display overwhelm physical use. Changing how we hold a cup, changes our perception of the cup. It grabs our attention; it's harder to overlook or ignore. But at the same time there is great value in a reticent cup for it demands use. As a maker, one of my guiding principals is to return to original sources--not someone else's interpretation. 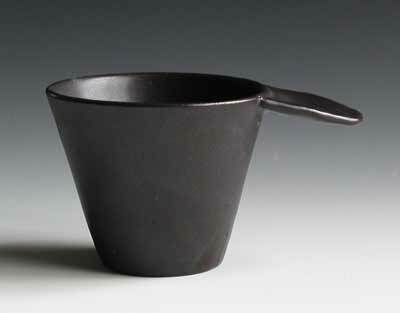 Isamu Noguchi, for instance, owned this 3rd-5th century Japanese earthenware teacup. Inspired, Noguchi made this earthenware sketch along with a plaster mockup of a potential base. His final porcelain design though quite intriguing was never manufactured. Cups that transcend mere reassurance twist assumptions and rejuvenate numbed sight. Yet the target is ever moving. Human senses do become desensitized, inured to repetition. That novel, faceted beaker can become invisible after habitual use. Yet we can become equally jaded by endless intricate novelty--individual displays of over-the-top personality. One valid solution is an allegiance to nuanced, expressive forms that are amenable to varied use. Beyond the initial intrigue provided by the artist potter, creativity and change in using pottery is as important for maintaining a fresh and novel awareness. So imagine using the cups in this exhibit. 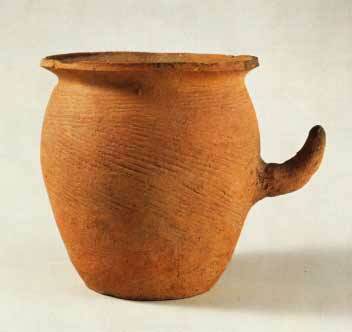 Intuit other unseen variations of intertwined form, process, and substance that can refresh your perception of the cup. 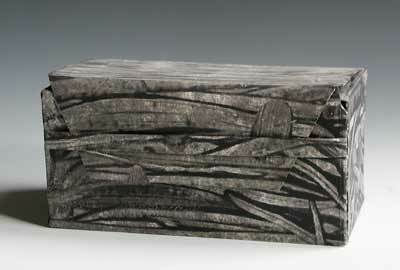 Jun Kaneko- H 5" x W 2.5"